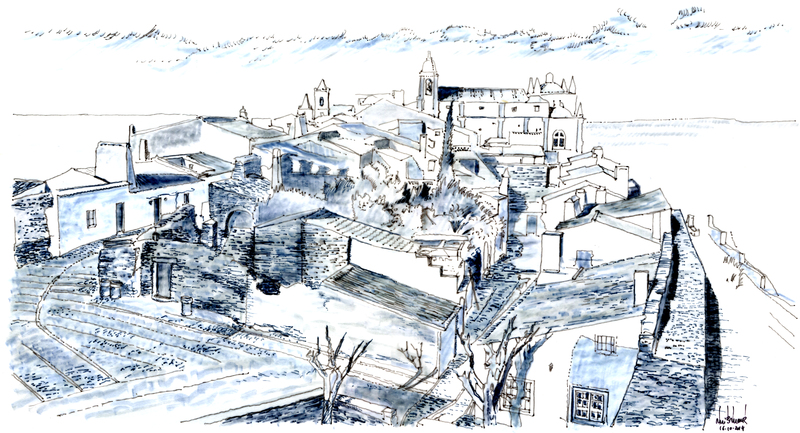 Monsaraz, ink on paper, Rui Barreiros Duarte, 2014. Monsaraz is a medieval village perched on a hill in Alentejo. Squint at the landscape and you see an abstract painting of white and pink shapes. Open your eyes and you see a world of peace and tranquility. Faint are the echoes of the battle in which Geraldo Sem Pavor (Gerald the fearless) first conquered the town from the moors in the 12th century. Gone are the busy years, early in the 14th century, when king D. Dinis built a castle to ensure that this strategic hill would forever remain Portuguese. The soldiers who kept watch from the castle towers were replaced by photographers who shoot with their cameras the majestic view. Alcobaça, ink on paper, Rui Barreiros Duarte, 2014. 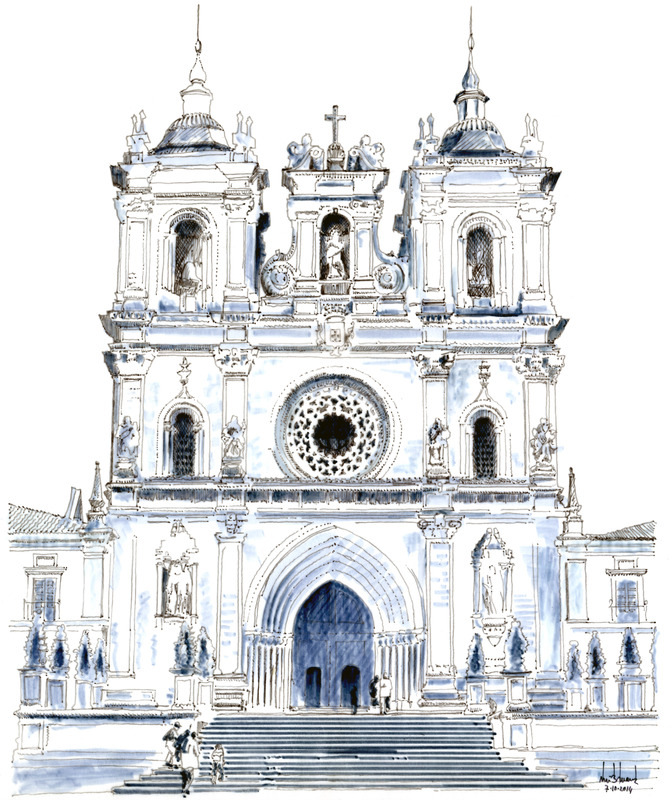 To understand Portugal, you have to visit Alcobaça. It was here that the first king of Portugal, Dom Afonso Henriques, founded a monastery in thanksgiving for his conquests. He laid the first stone in 1148 on a beautiful valley irrigated by two rivers, Alcoa and Baça. Alcobaça became a center of agricultural research with a vast library that included volumes printed by Gutenberg. The monastery served as a luxury hotel for the royal family and their guests, but it also baked bread to feed the poor. The kitchen of the monastery was famous throughout the kingdom. Water from the river Alcoa runs through the kitchen, providing water for cleaning and cooking. Built in an early gothic style, the monastery was expanded and renovated throughout the centuries. King Dom Pedro erected sumptuous tombs to celebrate his eternal love for Inês de Castro. Henry the Navigator, who was the abbot of Alcobaça, built a palace inside the abbey. Every stone of the Alcobaça monastery is a page of the history of Portugal. A noble mullet, pencil on paper, Rui Barreiros Duarte, 2014. Historians debate whether this aphorism, in which the mullet represents the nobility and the sardine the people, was good court politics. But it is good advice to those going to the fish market. Raia, Rui Barreiros Duarte, ink on paper, 2013. All southern European countries have their own fisherman’s stew. In Portugal, this classic dish is called caldeirada (pronounced “qaldeirahda”). It’s an appropriate name, since caldeira means caldron, a pot used in alchemy. When you combine fish, vegetables, and white wine, the result is indeed magical. 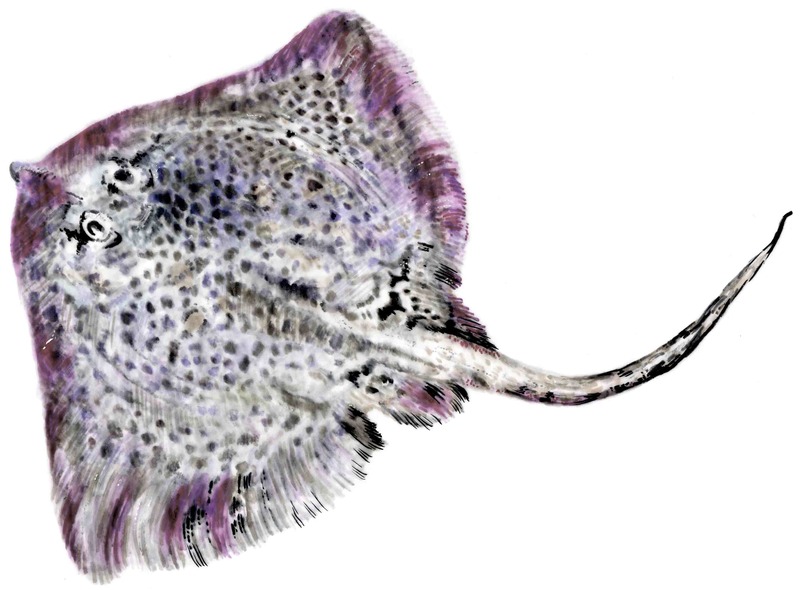 You can use different fish varieties, but the star of the caldeirada is the manta ray. Its delicious white flesh combines perfectly with the rich stock. The best places to eat caldeirada are near the ocean because this dish requires the freshest fish. According to Marcel Pagnol, the French writer born in Marseille, the secret of the fisherman’s stew is to put the fish in the pot while their tails are still moving. If you’re near the Portuguese coast, don’t miss a chance to eat a memorable caldeirada. Carapau, Rui Barreiros Duarte, ink on paper, 2013. The carapau is one of the most delicious fish in the Portuguese coast. Yet, it toils in obscurity while the Portuguese sardine basks in glory. Why? First, there’s the name. Carapau means “wood face”; who wants to eat a fish called wood face? Second, grilled carapau is often served with Spanish sauce (“molho à espanhola”). How can a Portuguese fish shine drowning in a Spanish sauce? We propose giving the carapau the recognition it deserves by changing its name to imperial sardine. This new identity will make carapau irresistible. Wouldn’t you prefer an imperial sardine to a regular one? Please help us spread the word about carapau’s new name; tweet, facebook, text, call. Let’s make the wood face smile! 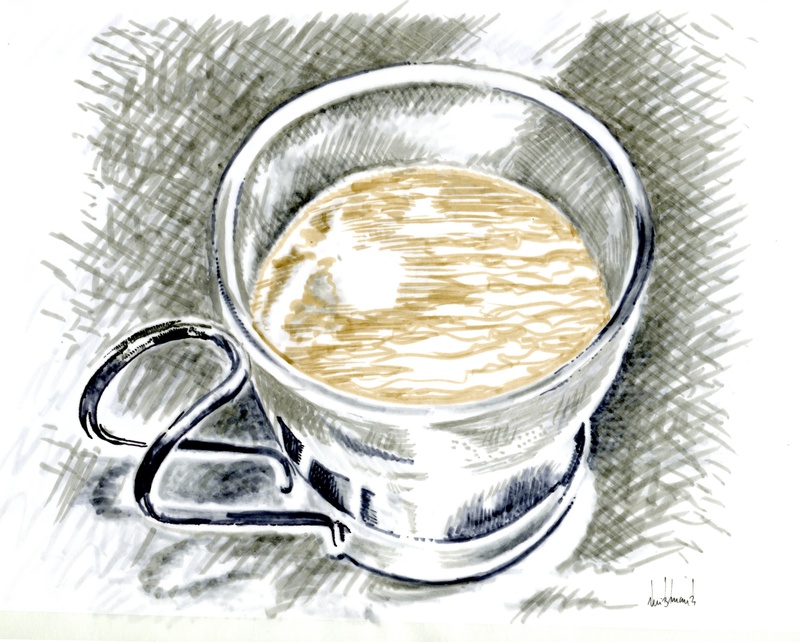 A cavala, Rui Barreiros Duarte, ink on paper, 2012. Fernand Point’s famous cookbook, Ma Gastronomie, includes two mackerel recipes. 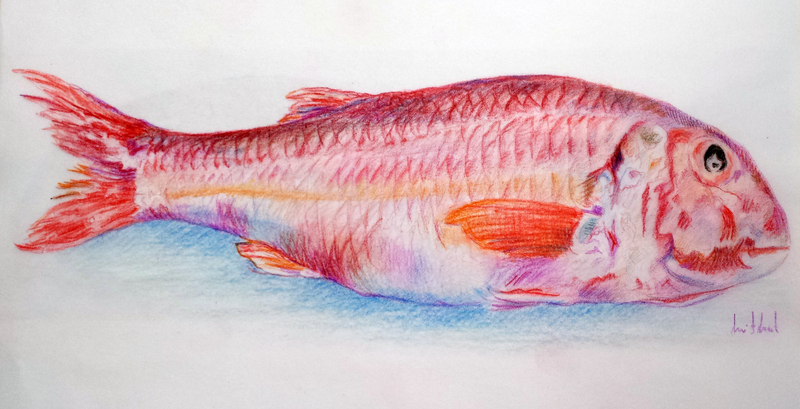 But in Portugal this fish, known as “cavala,” has never been popular. When fish mongers find mackerel mixed with other fish, they often give it away. 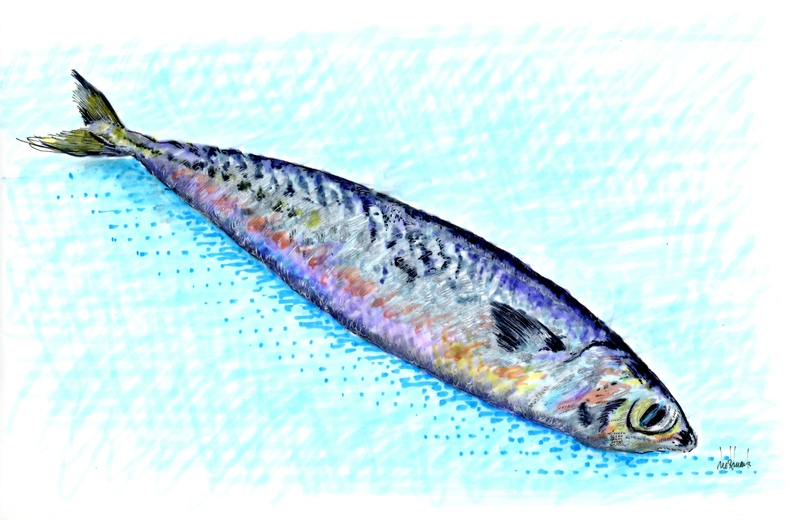 We worry that our national indifference toward the mackerel might make it swim to France in search of recognition. Luckily, chef José Avillez decided to pay tribute to this wonderful fish at his restaurant, Belcanto. His recipe starts with a traditional “salmoura”: the fish is soaked in water, salt and sugar. It is then sliced and marinated in an infusion of rice vinegar and green apples. 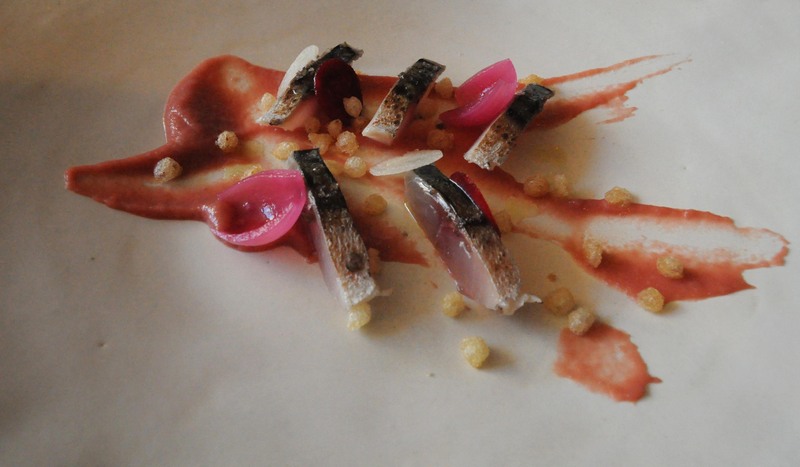 Finally, the mackerel is seared and served with delicately pickled vegetables. If you go to Belcanto, please order this delicious dish. Help us keep the mackerel on the Portuguese coast! Belcanto is located at Largo de S. Carlos, 10 in Lisbon. Tel. 213-420-607.